Give Away Day!! Yay!! - Stop staring and start sewing! Yay! It's time for Give Away Day!! A huge thanks to Beth at Sew Mama Sew for organizing this fun day twice a year! Run over to her blog and look at the whole list of participants and join in. You might end up with some fun goodies! And don't give me that "I never win anything" whine because folks are trying to give you FREE STUFF here!! Here's what I'm giving away (I think you'll like it!). It a massive stack (5 yards total!) 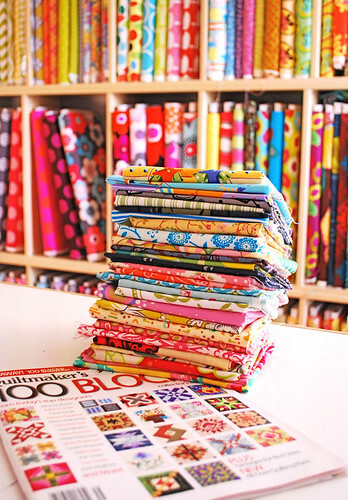 of totally awesome all your favorite designers fabric "scraps" (actually most of them are too big to be considered scraps but oh well), and a brand spankin' new copy of 100 Blocks Magazine. It has quilt block patterns designed by some of my very favorite quilters and between the magazine and the fabric you should be able to make oodles of blocks. Oodles! Just leave a comment and be sure to run over to my store Fabritopia and look around because I've received tons of new stuff (5 collections this week and 4 more next week)! I usually order complete collections so there's a great selection to make any project. You can join my mailing list on the bottom of the front page there or on the sidebar here to stay updated on all the new things going on in the wonderful world of fabric. Good luck! Oh, the drawing is open through Sunday, December 6th. Fun!